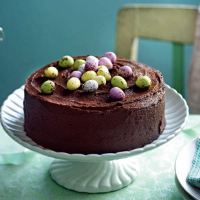 Chocolate is the treat of Easter, and this chocolate Easter cake is no exception. Moist and moreish, this cake will have everyone asking for seconds and fighting over the cute chocolate eggs on top. 1. Preheat the oven to 180°C, gas mark 4. Grease and line the base of 2 x 18cm cake tins with baking parchment. Using electric beaters, cream the butter and sugar in a bowl for 3 - 4 minutes until fluffy. Beat in the eggs, one at a time, then beat in the vanilla and milk. 2. Gently beat in the flour and cocoa, mixing until smooth. Divide the batter between the tins and bake for 20 minutes, until a skewer inserted into the centre of the cake comes out clean. Leave the cakes in the tins on a rack to cool. 3. For the icing, beat the butter for 2 minutes until creamy, then beat in the sugar for another 2 minutes. Warm the milk in a small pan, then beat into the butter and sugar with the vanilla and cocoa until smooth. 4. Place one of the cakes on a plate and cover with icing. Sit the second cake on top and cover the top and sides with icing. Scatter the chocolate eggs over the cake and serve.